I’m convinced the gatcha machines hates me, so I rarely play them, or I limit myself to just a few tries. Most of my Pink gatcha items were given to me by friends with better luck. I loooooove the Rainbow Ohmai Ear Muffs that Stacie Pryor gave me and the Pink version that I’m wearing today, is from Willow Zee. Without Stacie and Willow, my avatar would probably be wearing some less desirable colored Ear Muffs. 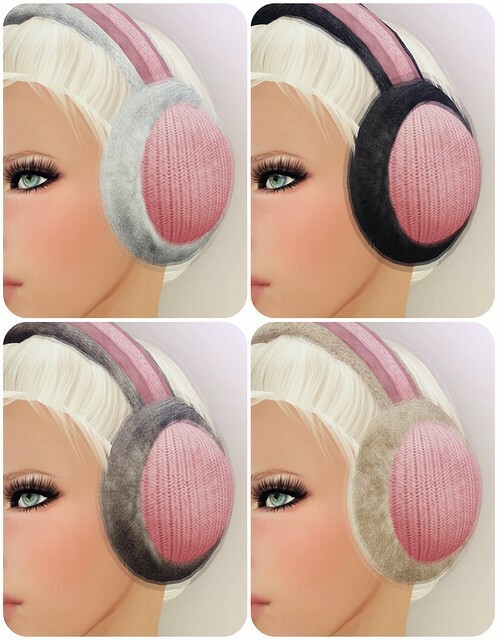 The Ear Muff is scripted to change 9 different fur colors! See the whole range here, on Anya Ohmai’s Flickr image. Visit the Seasons Hunt Gatcha to play; $30L per spin. I didn’t want to go with a typical Winter look, so I mixed-and-matched some stuff I already had in my inventory, and paired it with a fabulous pair of Survivor Boots from Redgrave (it’s new!). Ohmai really has fluffiness down to an art. Interesting mix you’ve chosen, earmuffs and a bra… And yet you make it work! Looking lovely, as always.